*New events added regularly. Please check back for details. Thursday, January 9, 2020 at 10:00am - New Adventures in Piano Listening (private presentation). Sunday, September 15, 2019 at 8:00pm - Solo Recital, Kitchener Waterloo Chamber Music Society, 57 Young Street West, Waterloo, ON. Performing an all-Bach program including the Goldberg Variations and selections from The Well-Tempered Clavier, Books I and II. Wednesday, July 3, 2019 at 7:30pm - Solo Recital, Summer Concert Series, The Chamber Music Society of Mississauga at the Riverwood Barn, 4300 Riverwood Park Lane, Mississauga, ON. Performing the Goldberg Variations by J. S. Bach. Tuesday, June 25, 2019 at 1:30pm (rescheduled from March 26) - The Great Pianists: Stories, Music & More at the Brampton Public Library Chinguacousy Branch, 150 Central Park Drive, Brampton, ON. Wednesday, May 22, 2019 at 12:15pm - Solo Recital, Noon Hour Concert Series at St. Andrews Presbyterian Church, 54 Queen Street North, Kitchener, ON. Performing the Goldberg Variations by J. S. Bach. Monday, May 20, 2019 at 12:15pm - Solo Recital: The Mighty Goldberg Variations, Music Mondays at The Church of the Holy Trinity, downtown Toronto, 10 Trinity Square (beside Eaton Centre). Thursday, April 11, 2019 at 2:30pm - The Great Pianists: Stories, Music & More at the Vaughan Public Library Bathurst Clark Resource Library, 900 Clark Avenue, West, Vaughan, ON. Monday, April 8, 2019 - The Great Pianists: Stories, Music & More (private presentation). Saturday, April 6, 2019 - Adjudicator, Beckettfest (St. Matthew's Lutheran Church, 54 Benton St., Kitchener, ON). March 25-30, 2019 - Adjudicator, Junior Piano Division, Peel Music Festival (St. Andrew's Presbyterian Church, 295 Queen Street South, Streetsville, ON). Wednesday, March 6, 2019 at 7:00pm - The Great Pianists: Stories, Music & More at the Aurora Public Library, 15145 Yonge Street, Aurora, ON. Monday, March 4, 2019 at 7:00pm - The Great Pianists: Stories, Music & More at the Vaughan Public Library Woodbridge Branch, 150 Woodbridge Avenue, Woodbridge, ON. Sunday, March 3, 2019 - The Great Pianists: Stories, Music & More (private presentation). Monday, February 25, 2019 - Adjudicator for Piano Assessments (private). Saturday, February 9, 2019 at 2:00pm - Piano Listening for Kids at the Log Cabin located at the Bradley Museum, 1620 Orr Road, Mississauga, ON. (Advance registration required). Thursday, January 31, 2019 at 1:30pm - The Great Pianists: Stories, Music & More at the Brampton Public Library Springdale Branch, 10705 Bramalea Road, Brampton, ON. Friday, January 25, 2019 - The Great Pianists: Stories, Music & More (private presentation). Thursday, January 10, 2019 at 10:00am - The Great Pianists: Stories, Music & More (private presentation). Wednesday, November 7, 2018 at 7:00pm - The Great Pianists: Stories, Music & More at the Kitchener Public Library Main Branch, 85 Queen Street North, Kitchener, ON. Wednesday, October 24, 2018 at 6:30pm - The Great Pianists: Stories, Music & More at the Milton Public Library Main Branch, 1010 Main Street East, Milton, ON. Tuesday, October 2, 2018 at 1:30pm - The Great Pianists: Stories, Music & More at the Brampton Public Library Cyril Clark Branch, 20 Loafer's Lake Lane, Brampton, ON. Saturday, September 22, 2018 at 7:30pm - Solo Recital, Brampton Chamber Music Concert Series, St. Paul's United Church, 30 Main Street South, Brampton,ON. Performing the Goldberg Variations by J. S. Bach. 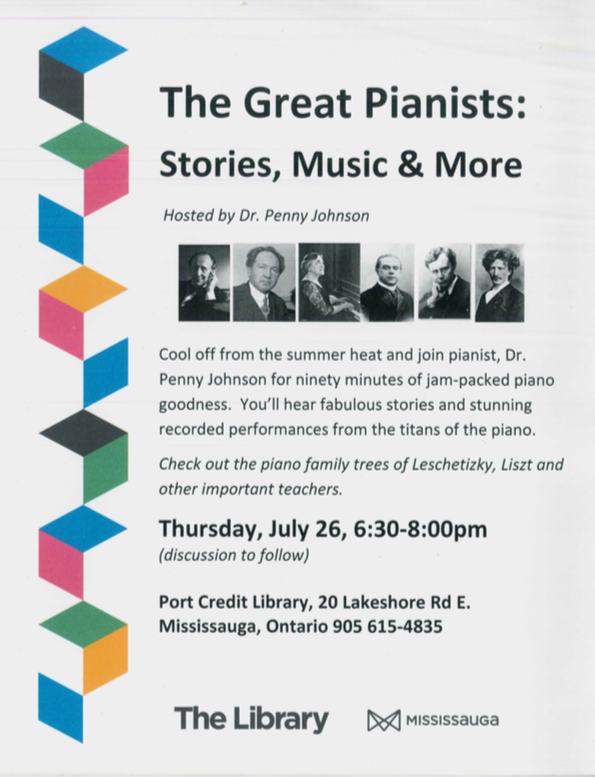 Thursday, July 26, 2018 at 6:30pm - The Great Pianists: Stories, Music & More at the Mississauga Public Library Port Credit Branch, 20 Lakeshore Road East, Mississauga, ON. Wednesday, April 25, 2018, at 12:15pm - Solo Recital, Noon Hour Concert Series at St. Andrews Presbyterian Church, 54 Queen Street North, Kitchener, ON. Performing an all-Bach program. Monday, March 26 thru Saturday, March 31, 2018 - Adjudicator for Peel Music Festival,Junior Piano Division, St. Andrew's Presbyterian Church, 295 Queen Street South, Streetsville, ON. Saturday, February 10, 2018 at 7:30pm - Solo Recital, Caledon Chamber Concerts, St. James Anglican Church, 6025 Old Church Road, Caledon East, ON. Performing an all-Bach program. Saturday, November 25, 2017 at 7:30pm - Solo Recital, Brampton Chamber Music Concert Series, St. Paul's United Church, Brampton, ON. Performing selections from Art of Fugue by J. S. Bach including the completion of the unfinished final movement by Penny Johnson. 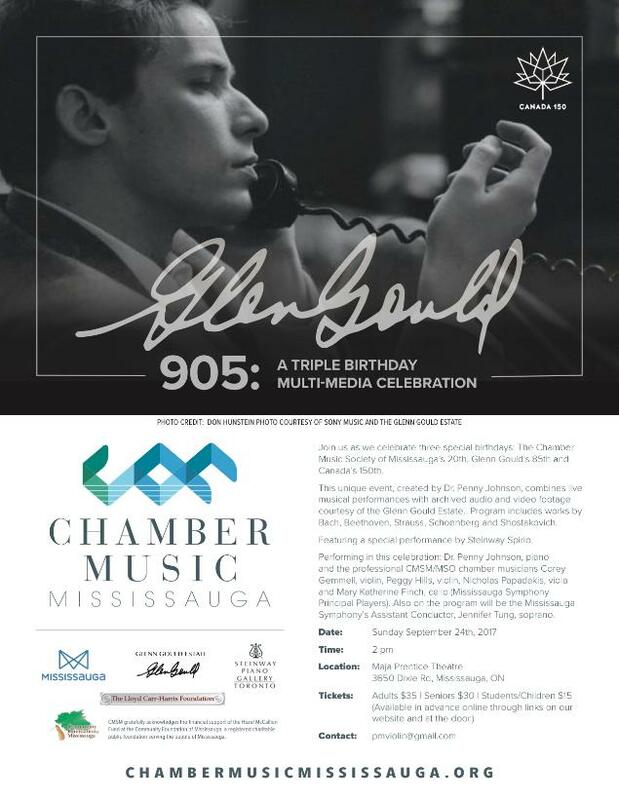 Friday, September 8, 2017 at 1pm - Glenn Gould 905 Preview Concert, Steinway Piano Gallery Toronto, #8-2651 John Street, Markham, ON. Works by Shostakovich and Beethoven. Saturday, July 8, 2017 at 8pm - Solo Recital, Kitchener Waterloo Chamber Music Society, 57 Young Street West, Waterloo, ON. Performing an all-Bach program titled, "J. S. Bach and the Subject of Polyphony Through Time." Monday, June 5, 2017 at 12:15pm - Solo Recital, Music Mondays at The Church of the Holy Trinity, downtown Toronto, 10 Trinity Square. Performing an all-Bach program titled, "J. S. Bach: Rebel With a Contrapuntal Cause". Saturday, May 6, 2017 from 9am-6pm - Senior Piano Adjudicator for Brampton ORMTA Piano Festival, St. Paul's United Church, Brampton, ON. Friday, March 3, 2017 at 7pm - Workshop, "From the Pianist's Toolbox: Techniques for Effectively Practicing the Music of J. S. Bach", Westside Lutheran Church, Barrie, ON. Saturday, February 25, 2017 from 1-4pm - Bach Master Class, The Beckett School, 190 Lester Street, Waterloo, ON. Sunday, December 11, 2016 at 2pm - Solo Recital, Fairways, 1400 Dixie Road, Mississauga, south of the QEW and just west of the 427. Performing an all-Bach program. November 17, 2016 at 12pm - Solo Recital, Steinway Piano Gallery Toronto, Mississauga, ON. Performing an all-Bach program. October 29, 2016 at 7:00pm - Solo Recital, Living Room Project, Burlington, ON. Performing an all-Bach program. October 19, 2016 at 12pm - Solo Recital, Noon Hour Concert Series at St. Andrews Presbyterian Church, 54 Queen Street North, Kitchener, ON. Performing an all-Bach program. 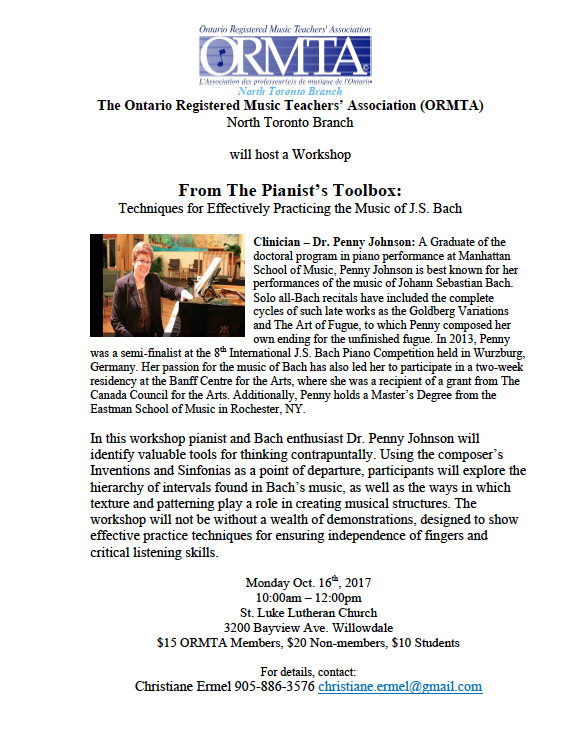 October 6, 2016 - Workshop, "From the Pianist's Toolbox: Techniques for Effectively Practicing the Music of J. S. Bach", Steinway Piano Gallery Toronto, 1900 Dundas Street West, Mississauga, ON. September 26, 2016 - Workshop, “From the Pianist’s Toolbox: Techniques for Effectively Practicing the Music of J. S. Bach.' (Presented by ORMTA Etobicoke/Mississauga branch). May 14, 2016 - Solo Recital, Brampton Chamber Music Concert Series. Performing an all-Bach program. April 16, 2016 - Solo Recital, Chamber Music Society of Mississauga, Great Hall Series. Performing an all-Bach program. April 17 & 20, 2015 - Solo Recital, Steinway Piano Gallery Toronto, 1900 Dundas Street West, Mississauga, ON. Performing an all-Bach program. 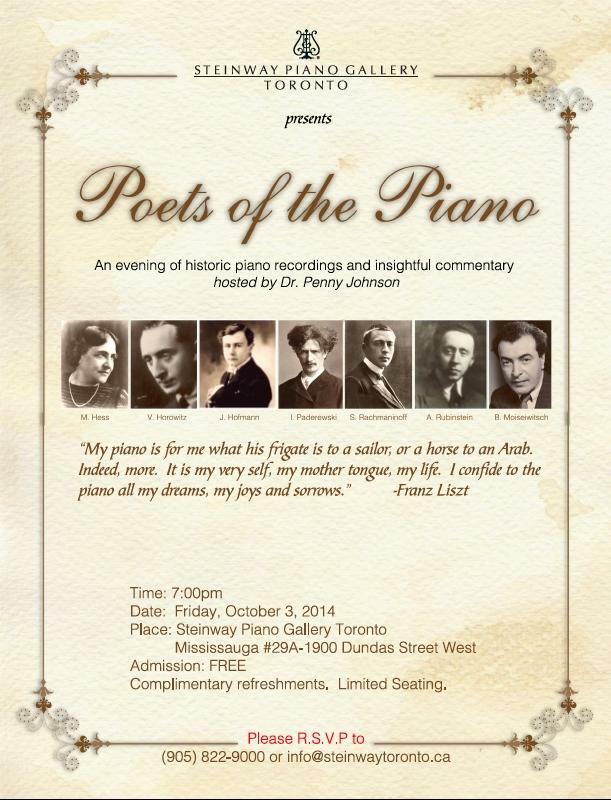 October 3, 2014 - "Poets of the Piano" at Steinway Piano Gallery Toronto, 1900 Dundas Street West, Mississauga, ON.